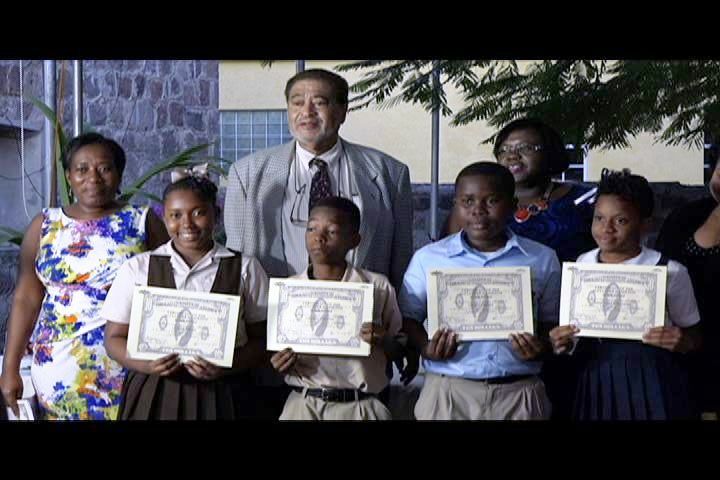 NIA CHARLESTOWN NEVIS (January 13, 2015) — Leinae Tross, Diquanja Williams, Veonn Caines and Ordell Griffin are the 2015 recipients of the Alexander Hamilton Scholarships. They were presented with certificates of recognition by Deputy Governor General His Honour Eustace John at the annual Alexander Hamilton Scholarship Fund Tea Party, on January 09, 2015. The Fund was established in 1965 by the Trott Family, to assist deserving secondary school students with uniforms, fees, books and other school supplies. However, in recent times the scholarship has been sustained by members and well-wishers of the Nevis Historical and Conservation Society (NHCS) past recipients and members of the community. It is administered by the Department of Community Development in the Nevis Island Administration (NIA) and the NHCS. In a report on the status of the Fund at the close of 2014, Director of Community Development Janette Nisbett Meloney noted that over the past seven years the Department in collaboration with the NHCS hosted the Tea Party in commemoration of the birthday anniversary of Nevisian-born Alexander Hamilton, to raise awareness of the scholarship and to raise money for the Fund. 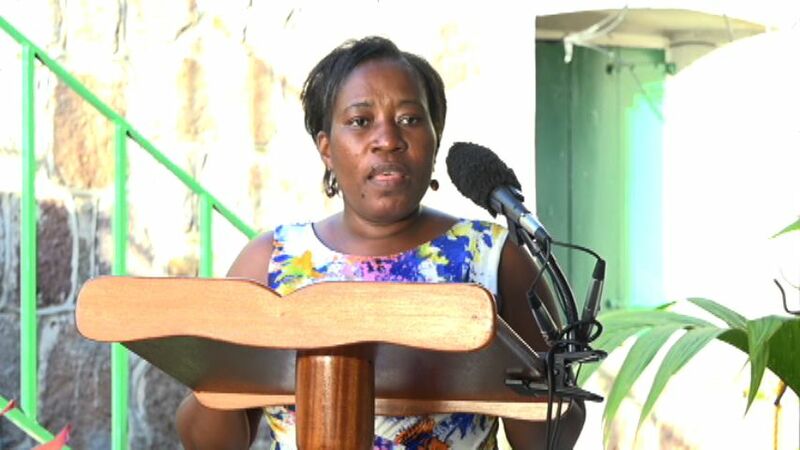 She explained that at the end of 2014, there were 15 students enrolled in the Scholarship programme but on January 10th the birthday anniversary of Hamilton four more students were added which brought the total of students enrolled to 19. Nine came from the Charlestown Secondary (CSS) and 10 from the Gingerland Secondary School (GSS). In July 2014 four of the scholarship holders ended their part in the programme on completion of their secondary education. Meloney also highlighted some of the recent achievements of students who had received scholarships from the programme. “Kanika Glasgow graduated from form 5A2 of the GSS with CXC passes in Electronic Document Preparation and Management, Information Technology and English. Mr. Glasgow is now a Call Centre Operator at Brown Hill Communications. “Tenisha Browne graduated from form 5A1 of the CSS with CXC subject passes in Food and Nutrition, Information Technology, Office Administration, Principles of Business, Principles of Accounts and Mathematics. Ms. Browne is now attending the Nevis Sixth Form College and is pursuing studies in Business,” she said. According to Meloney, Sadiki Tyson graduated from Form 5A1 of the GSS with CXC subject passes in English, History, Agriculture Science, Geography, Building Technology, Mathematics, Biology, Chemistry and Human and Social Biology. He also attained a distinction in Human and Social Biology. He is at present attending the Clarence Fitzroy Bryant College (CFBC) in St. Kitts and pursuing studies in Mathematics, Physics and Geography. Leandre Dyer graduated from the GSS with 12 CXC subject passes in History, English, Food and Nutrition, Agriculture Science, Information Technology, Music, Principles of Business, Integrated Science, Human and Social Biology, Economics, Mathematics and Spanish. He also attained a distinction in Principles of Business and Integrated Science. Dyer is currently pursuing studies in Information Technology at the CFBC. “We are very proud of them and would like to congratulate all of them on their achievements and to wish them success in their future endeavours,” she said. The Director of Community Development indicated that 2014 was not without its share of challenges for the Scholarship Fund. According to Meloney, there had been cases of misconduct and negligence among scholarship holders and some disappointing results came from some of the students. However, she said some students were able to maintain a fairly high standard in their performances. Meloney noted, that the Fund’s Administrators had held at least two meetings with scholarship holders during the year to bond with the students; establish a line of communication; outline guidelines that governed the scholarship and to address pertinent issues which existed at the time; keep the line of communication open; encourage them to take their school work seriously; to encourage them to model good behaviour and to fulfil their hours of community service.